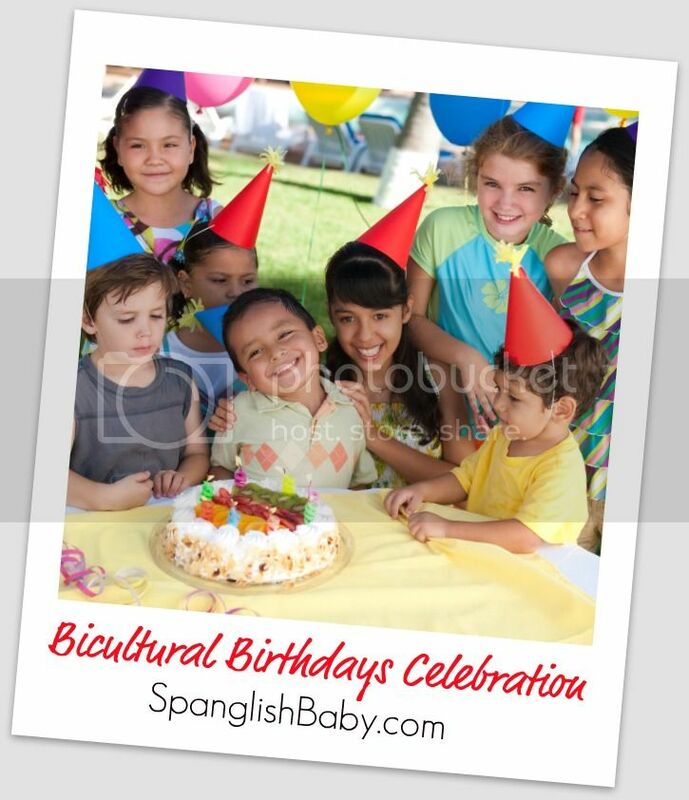 Editor’s Note: This whole week is dedicated to the topic of Bicultural Birthday Celebration. Make sure you’re subscribed to receive our posts because we have an awesome round up of guest posts and fabulous giveaways. Growing up in New York during the late 70s and 80s (shhh… don’t tell anyone), birthday parties in the United States were low key as compared to today. They consisted of sandwiches or pizza, pin the tail on the donkey, musical chairs, cake and a big old “adios” as you handed your friends their “bootie bag” on the way out your door. Oh, yeah. Parties were held at home – en casita. If you were lucky you might have it at McDonald’s or the back room of your local diner. That’s if you were lucky. In my case I didn’t celebrate many birthdays in N.Y. In fact, in the time leading up to my 25th birthday, I probably celebrated no more than 6 birthdays in the States. That’s because I was born in the summer and every summer, without fail, we packed our bags and headed to the country. The country of Spain. In the 1960s the Spanish government promoted a tourism campaign with the motto “Spain is different.” “España es diferente.” It’s true. Spain was (and still is) different in many ways, with birthday celebrations being no exception. My most vivid birthday memory is my favorite birthday custom of all – “los tirones de oreja” or “the ear tugs”. Growing up in the U.S. back in the day, on your birthday, your friends would give you a punch in the arm for each year of your life, plus one for good luck. Not so in Spain. There, your friends and family would pull your earlobe, one tug for each year of your life, plus one for good luck. Naturally, the older you got, the more “energy” your buddies put into pulling your ear. If you were a boy, you were doomed. That is to say, starting in middle school and ending somewhere in your late teens it was in your best interest to avoid your more “gamberro” (troublemaker) friends because by day’s end your ears would be aching. Naturally, your mamá and papá would take it easy on you, with only a slightly harder tug for “el de la suerte“. Another “costumbre” is the one of whose responsibility it is to “invitar” or, plainly put, pay. When you are a child, naturally, you are treated on your birthday. However, as soon as you were old enough to carry some (then) pesetas or (now) euros in your pocket, it was your responsibility to pay. So, if you went out with your “pandilla” (group of friends) to the local “terraza” (outdoor café/bar) on your birthday, it was your responsibility to treat everyone to something. That something could run the gamut from Coca Colas, to a “ración” (small portion) of “pinchos” (appetizers on a toothpick) to “cañas” (glasses of beer). Birthday parties were low key growing up as well. Generally they consisted more of having your amigos over during “la merienda” – snack time. This meant treating them to “pasteles” (Spaniards refer to pastries as pasteles, not to be confused with some Caribbean or South American countries’ versions of the word), “bollos” (sweet breadlike treats) or maybe “chocolate con churros”. I always wanted to teach my Spanish friends about what we did in the States so I would ask my parents to order a cake. The funny thing about the cakes there were the flavors. For example, whereas here strawberry shortcake is pretty run of the mill, in Spain “yema” (egg yolk) was the standard. I was not a big fan of it then. Now… I love it. Naturally, the older you got, the more creative you got on your birthday. By the time I was 14, la pandilla and I would spend the morning shopping either in the “ultramarinos” (markets) or our parent’s fridges for pan, arroz, pollo, cebolla, ajo, tomate, azafrán, chorizo, morcilla, Fanta and fruta. 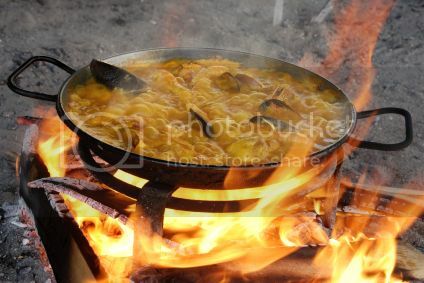 Then in the afternoon we would beg our parents to borrow a “paellera” (typical paella pan), a sarten (frying pan), cuchillos y tenedores (forks and knives), cucharas de palo (wooden spoons) y cerillas (matches) and we would head out to “el campo”, build a fire and cook our meal. 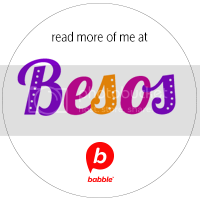 (I still remember the birthday I ate so much morcilla (blood sausage) I spent the evening throwing up… good times, good times. My mother got so angry…) We had cookouts in the countryside because we were in the Sierra de Guadarrama outside Madrid. Our friends from Galicia – to the north – would tell us about seafood cookouts and ancient pagan “queimadas” on the beach. The ones from the Andalucía – to the south – would talk about parties with “sevillanas” (typical folk dances). Music is essential at all times no matter what part of Spain you are in. Now as the world gets smaller, the differences in birthday celebrations are lessening. “El mundo es un pañuelo” as the expression goes. The world is a handkerchief. It’s true. But still most of these customs remain, and typical birthday foods – as with any holiday – generally revolve around “lo que da la tierra” or what is produced locally. These Spanish traditions are so ingrained in me that my Greek American hubby and I pull our daughters’ ears on their birthdays. Sadly, neither Carvel nor the local corner bakeries offer yema birthday cakes in our area. But even though we throw elaborately themed birthday parties for our girls as is customary in NY today, you can bet there is always at least one “chorizito” lurking in a corner somewhere. As for my birthday this summer, I’ll be cooking a paella in the Outerbanks. Maria Amelia was raised in a Spanish speaking home in a neighborhood with only a handful of other Latino and Spanish families. Despite being looked down upon for speaking Spanish at times throughout her childhood, her parents always told her to be proud of her family, her culture and her heritage. 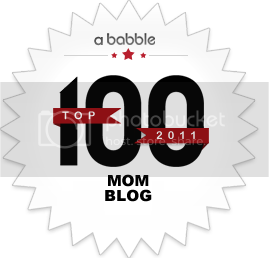 She shares her pride and her love in her blog Mommylogue. Vivi en Espana, cuando era pequena y ahora recuerdo con tu articulo, que cada cumpleanos debia llevar al colegio montones de dulces, para repartir entre todos mis companeros de clase. Nunca entendi por que, si era mi cumple, no era yo la que recibia los dulces, jeje. Mis padres me llevaban el dia anterior, a la confiteria, a llenar bolsas de caramelos, especialmente de gominolas. Siempre me encantaron las gominolas! Me has despertado aun más recuerdos. Gracias Cristina! Boy did this post jog memories. I used to love those McDonald’s birthdays as a kid. Your descriptions of Spanish birthdays brought back memories from when I lived there. The photo of paella has me craving it, and so I am going shopping for the ingredients to make a rica paella this weekend. I’m glad that the post jogged some memories for you. I love it when I have spend a few moments reflecting on my own. I hope your paella comes out well!! 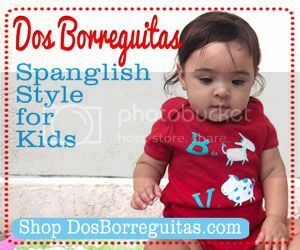 Neat Post, Could someone give me some tips for throwing a birthday party for my soon to be 3year old – my family is white white white and my husbands is as Mexican is they come haha. I am having difficulty imagining how I am going to merge these two cultures smoothly. (“white” version: nice short intimate gathering vs. Mexican version: big loud and late? Lol ) Please some ideas? i could think you are an expert in this subject. Fine along with your permission allow me to grasp your feed to keep updated with forthcoming post. Acabo de descubrir tu blog y “me ha encantado” como diríais en España. Viví 3 anos en España y se me hacia raro también lo de invitar cuando era tu cumpleaños. Sabes que me hija nació en Madrid y con tu blog se me ocurrió hacerle una fiesta un año con un “tema” “español”, aunque la paella no me sale todavía! includes remarkable and really good material in favor of visitors. I’ve learn this put up and if I could I want to recommend you some fascinating issues or suggestions. sources back to your site? My blog is in the very same niche as yours and my users would truly benefit from some of the information you provide here. this webpage gives feature based content. can extend living of your respective teak furniture. Internet as well as your nearest home and garden center. if in conjunction with colorful cushions and pillows with softer textures.